The National Institutes of Health awarded two grants totaling more than $2 million to a synthetic and bioanalytical organic chemist at The University of Toledo whose research is primarily focused on Alzheimer’s treatment. The National Institute on Aging awarded Dr. Isaac Schiefer, assistant professor in the Department of Medicinal and Biological Chemistry in the College of Pharmacy and Pharmaceutical Sciences, $1.9 million over five years to continue developing a drug to treat Alzheimer’s disease, and the National Institute on Drug Abuse awarded him $153,500 over two years to study drug targets to addiction centers in the brain. At 33 years old, Schiefer is among the youngest investigators to receive this level of research support across all NIH institutes, according to NIH records. Schiefer developed a prototype molecule that improves memory in mice, which was the first step toward developing a drug that could be given to Alzheimer’s patients. The prototype molecule was designed to increase brain-derived neurotrophic factor, also known as BDNF. BDNF, a protein, is important for long-term memory, and patients with Alzheimer’s disease have been shown to have less of it. Schiefer said BDNF’s ability to heal damaged brain cells could be compared to how Human Growth Hormone, known as HGH, helps athletes recover from muscle fatigue or injury. He received a $100,000 grant from the Alzheimer’s Association in 2015 and a $10,000 grant from the American Association of Colleges of Pharmacy in 2014. 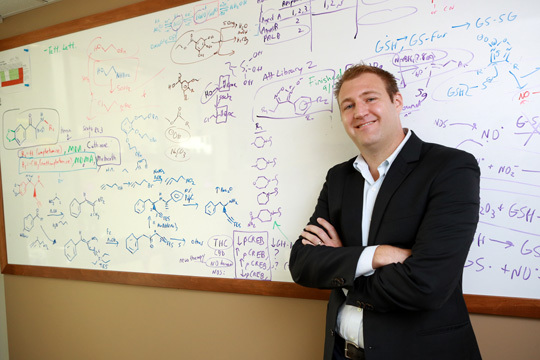 His research was recently published in the Journal of Medicinal Chemistry. Schiefer said his goal is to translate molecules created and developed in the lab at UT into the clinic as safe and effective therapeutics for patients. This entry was posted on Wednesday, May 30th, 2018 at 3:12 am and is filed under News, Pharmacy and Pharmaceutical Sciences, Research, UToday .